Ever since I first saw Cornelia Parker's sculpture, Hanging Fire (Suspected Arson) at the ICA, I've wanted to talk about it and think about it. Now that Damien Ortega's piece, Cosmic Thing, is installed, I have an excuse. I haven't yet seen the Ortega sculpture, but I did have a look at Sebastian Smee's video tour of the exhibit. First, about Hanging Fire...what I love about it is the flow between the narrative, conceptual elements of the piece and its overall presence. The arrangement of floating, delicate bits of wood and nails recovered from an arson site creates a feeling of ascension, as if the material body of the building has become the building's spirit, rising upward. The spaces around the bits of wood translate as the memory of the building's rectangular and upright form. For a conceptual piece, it feels incredibly intimate. I think this is because it conveys the feeling of ascension so well, and because the narrative is specific: the life and death of a building. Call me a spiritualist, but when I see objects floating around me, I think of ascension. So I'm curious to see how Ortega's piece reads. 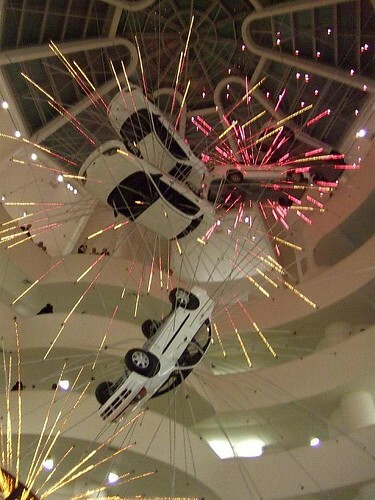 Cosmic Thing also calls to mind Cai Guo-Quiang's suspended cars at the Guggenheim last year. For me that show was more about spectacle and emotional distance, than meaning. Too often artists and art viewers are interested in speaking in tones of cool emotional distance, like the way the teens I know talk...especially when they want to hide authentic emotion.